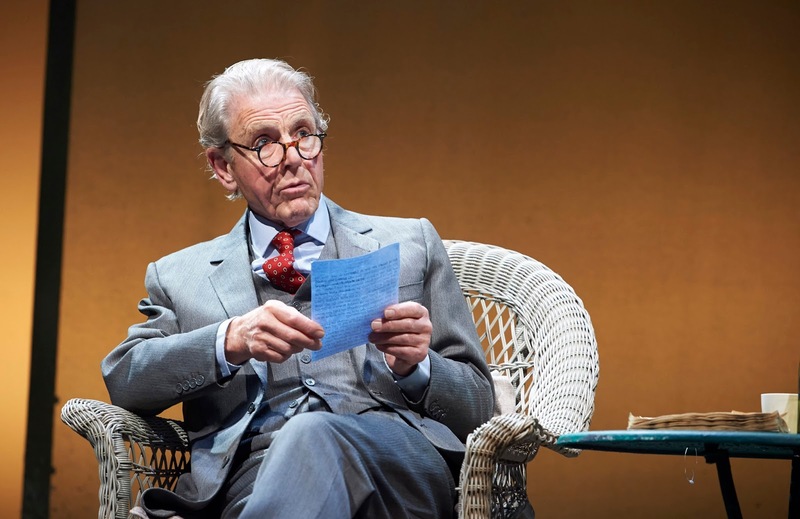 The opportunity to see a colossus of acting take on the role of one of the most well regarded of British poets and writers is one that comes along rarely, and as Sand in the Sandwiches proves, you would be unwise to miss it. 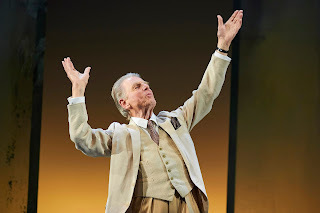 Written by Hugh Whitemore and directed by Gareth Armstrong, Sand in the Sandwiches sees Edward Fox ease us with precision and control through the life and work of John Betjeman. It is described in the advertising as "a celebration", and it is at all times just that. This is not a showy play, it is one of the most delicate moments added to further delicate moments of poem, anecdote and life moments. On Fontini Dimou's simple but stunningly gorgeous set, three chairs, one table and two simply decorated gauze backdrops, Fox moves from one nicely judged scene to another. 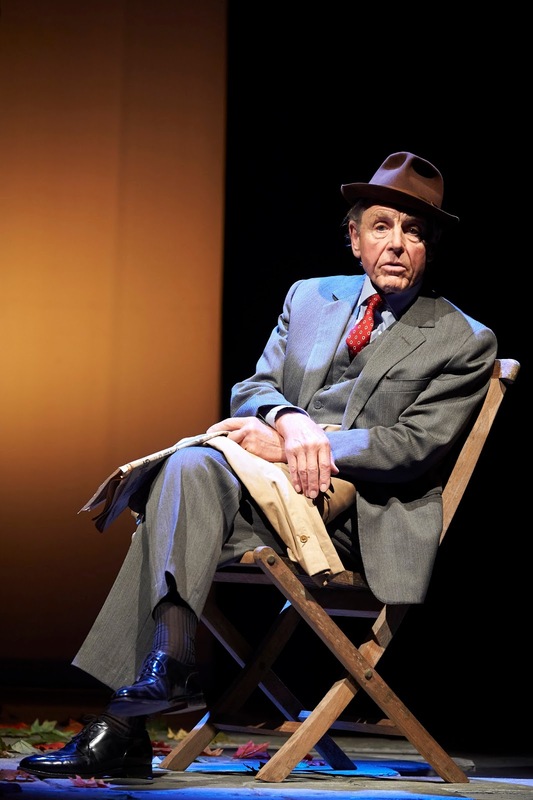 Howard Harrison's lighting casts the most slowly unfolding pastel of colours (mostly autumnal in feeling) across the stage, as one little scene shifts into the other. Some perhaps would have fault with the simplistic nature of the direction, however it treats its performer with respect, leaving Fox the chance to breath all the life he can into the interweaving moments of Betjeman's life from his dropping of an N from his name to avoid the German spy jibes and onto his recollections of college and the persuasion of all of its students at that time with their filling of that spare evening hour. It is soft and subtle and then at the most unexpected moments huge explosions of humour which rides through the audience like a laughing simultaneous Mexican wave. The poetry of Benjamin bleeds in and out of the piece and for those unfamiliar with his work (as was I), you are occasionally never sure whether another poem has begun or the anecdotes continue, such is the flowing and relaxing nature of the script. Edward Fox is exemplary in the role, capturing a playful and childish edge, belying his octogenarian age. His movement is slow and delibrate as he moves gently from chair to chair as simple easing music from Simon Slater bridges the scenes. Fox delivers the dialogue in a soothing style of an afternoon radio play on the ears, but with bolts of bedevilment out of the blue. A limited effort has been made to make Fox's appearance like Benjamin, with the exception of trilby hat and overcoat, however, this is unimportant, this is all about the words as befits Betjamen. Sand in the Sandwiches is like a warm comfort blanket, directed with a kind of poetry of its own. Easy on the eye, lilting on the ear and a performer still at the top of his game. Simply a delight. Performance reviewed: Thursday, May 26th, 2017 at the Royal & Derngate (Royal), Northampton. Sand in the Sandwiches runs at the Royal & Derngate until Saturday 27th May 2017.